Nikka are one of the two major distillers in Japan (the other being Suntory) and they produce a range of both premium single malts and cheaper blends. 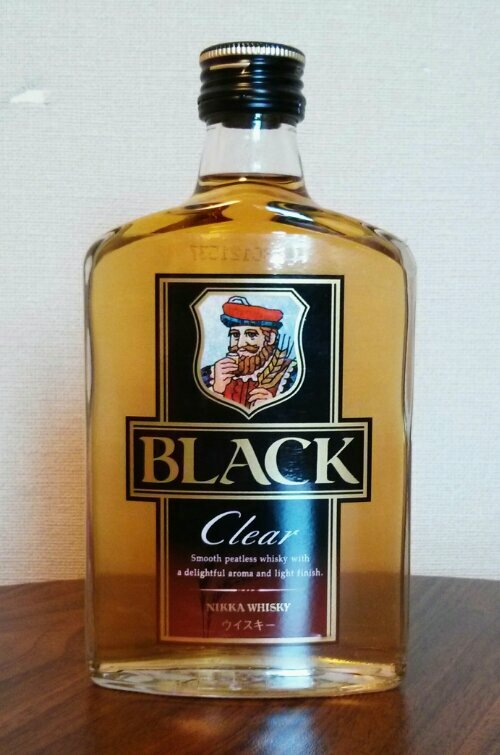 This is Black Clear, a rather confusingly named whisky from their blended side. It’s especially puzzling because it’s neither black nor clear, but rather a fairly normal (if slightly pale) whisky colour. The ‘clear’ in the name actually refers to the fact that this was the first Japanese whisky to use entirely unpeated malt. I confess that this surprised me a little, as I’d never really thought of Japanese whisky as being particularly peat focused. The aroma is enticing – clean, bright with a pure ethanol punch and a slight backdrop of honey sweetness. There is something about the smell that puts me in mind of a distillery – that raw, untamed alcohol. Watered, the sweetness is unsurprisingly lost and it becomes rather one dimensional and alcohol-led. In the mouth, it’s a little rough around the edges – a sweet start that slowly yields to a raw grain alcohol harshness, along with an unexpectedly strong alcohol heat given its low 37% ABV strength. The finish is short but nicely peppery and leaves you reaching for another sip. Water again robs it of any character, and even destroys the ahlcohol heat – but this is bottled at such a low strength you’d be mad to dilute it anyway. So, it’s a little rough and doesn’t take water well – but when I tell you that this 180 ml bottle cost me two pounds in the local 7-eleven, you might understand why I’m giving this whisky 3 stars. It’s not mind-blowing or complex, but it’s not claiming to be – it’s just a pleasant, drinking whisky that represents phenomenal value for money. Nicely reviewed, said about right. Have a bottle open in front of me now. Pleasant little whisky.